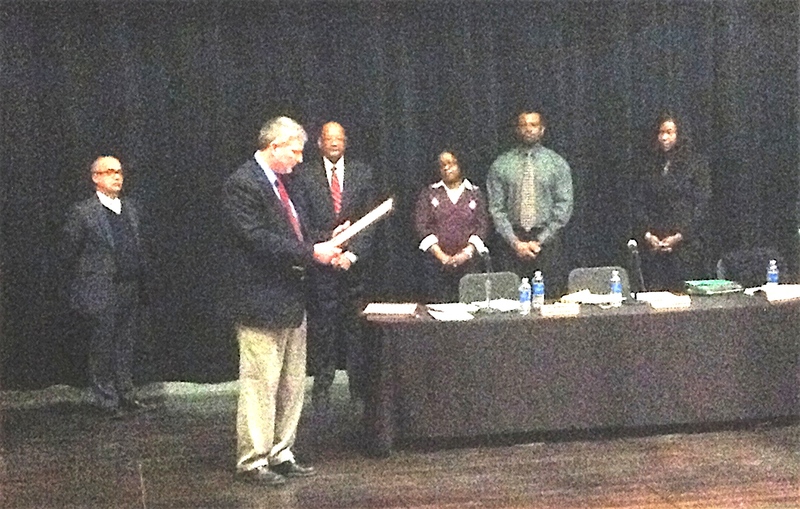 Muskegon Heights Public School Academy System has recognized three board members. State Senator, Geoff Hansen attended the February 25, 2013, Muskegon Heights Public School. Academy System Board of Education meeting to present special recognition to the Board of Education members. The Muskegon Heights Public School Academy System was created in July 2012 and currently serves 1,189 students – kindergarten through grade twelve. Senator Hansen commended the Board members for their dedication to the students of the Public School Academy System and the leadership that has been contributed to ensure that students are receiving the education and support services to meet the needs of each student. Muskegon Heights Public School Academy System, Regional Vice President / Superintendent said, “Our Board is exceptional and has been able to make huge accomplishments in a very short time.” The Board also received recognition from students from the four schools that make up the system. Additionally, the Board held a workshop Tuesday, February 27, 2013, to discuss student strategies related to improving student achievement. Community members who would like to learn more about the Muskegon Heights Public School Academy System should visit the system’s website at www.mhtigers.org. Please contact Alena Zachery-Ross, Regional Vice President / Superintendent for additional information by calling 231-830-3703.